This pumpkin flan recipe is the silkiest, creamiest, most elegantly spiced dessert you could serve at your fanciest Autumn dinner parties or decadent Thanksgiving dinners! I’ve made a number of pumpkin flan recipes with textures that were a bit too eggy or pumpkin-pie-like for my taste, so I set out to create the most heavenly, smooth version of this classic Autumn custard, and boy oh boy, this is it! I find it funny that opinions about whether or not flan is a fancy dessert really varies. Some folks consider it to be one of the fanciest desserts (I’m personally Team Fancy), and others consider it to be no fancier than rocky road ice cream. I think it might be because it’s a dessert that you can use not-so-fancy ingredients and still come up with an OK, sweet custard, – or you can use higher quality ingredients, your process can be more refined, and you’ll have a very different, simply elegant result. We’re making fancy flan with this recipe! We’re not using processed, overly-sweet condensed milk, we’re using all organic dairy and eggs, we’re using a high quality vanilla extract and we’re taking a few extra steps to ensure our flan is the fanciest. We’re blending our ingredients instead of simply stirring and we’re caramelizing our sugar to perfection! • It really helps if you have a white sauce pan to make your caramel. It can be tricky to see the exact color of your caramel if you have a dark pan, and your caramel can go from perfect to burned in just a few moments, so your ability to see color is key. But if you don’t have one, no worries. Just make sure to have a white plate or bowl handy so you can drip a little from time to time to check the color while it cooks. 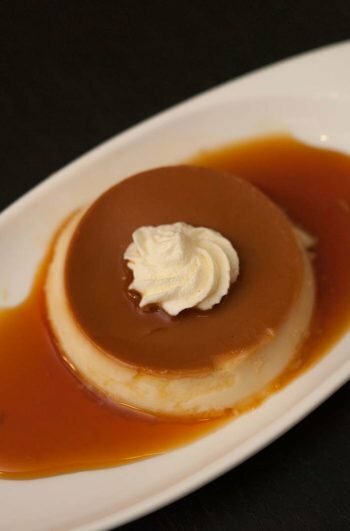 • The color of your caramel determines a lot about of your flan’s flavor. So if you want your flan to taste lighter and more delicate, you’ll want to stop cooking your sugar when it’s a light caramel color (about 8-10 minutes), and if you want it to be more rich and “bourbon” tasting, let your sugar cook until is a warm mahogany color (about 10-12 minutes). It’s really to your taste. Just make sure not to make that caramel too dark or it will just taste burned. • Be careful!!! Although this pumpkin flan appears simple enough, you’re creating some very hot melted sugar caramel and a single drop on the skin can be quite painful. You’re also creating a “bain-marie,” filling your baking pan with water up to the middle of the ramekins and this will make your pan quite heavy (and full of scolding hot water when removed from the oven), so make sure the kids and pups are nowhere near the kitchen when you make this recipe, and although I usually love a prosecco while I cook in the kitchen, a very sober head is HIGHLY recommended. Can this recipe be made in a pie plate instead of ramekins? Yes! simply pour your caramel and custard into a 9.5” pyrex pie plate or tin, and refrigerate. When you’re ready to serve, you’ll simply run a pairing knife around the side, place a plate below the flan and flip. Make sure your plate is not flat, however, because the caramel will run (deliciously) down the sides of the flan. Is flan a Mexican recipe? Yes and no. 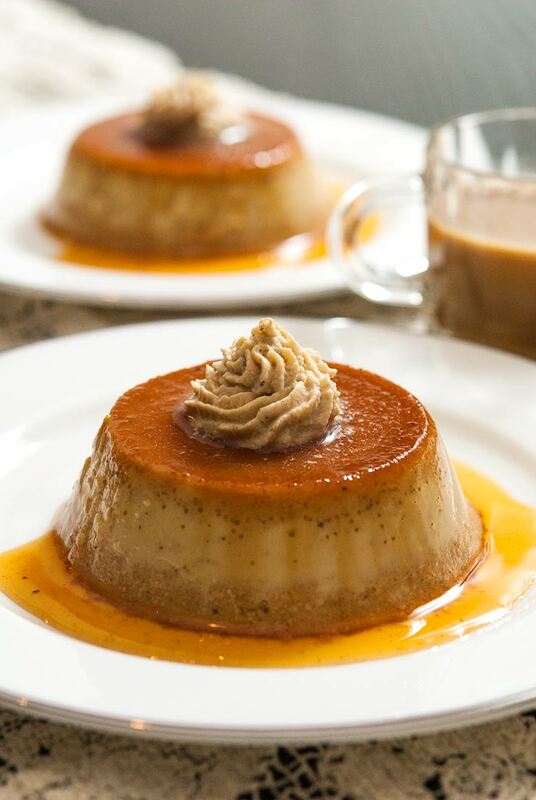 Flan dates all the way back to ancient Rome and its name is derived from the French word “flaon” which comes from an old German word meaning “flat cake.” It spread from Rome to England, France and Spain, then the Spanish brought it to Mexico, Puerto Rico, Cuba and beyond. Flan recipes can be found from South Africa to Ireland, so I think it’s fair to say that it’s a truly international dessert with regional tweaks that make it a little different and special in every country where you find it. You want to let it set for at least 5 hours after it’s placed in the fridge, but you really want to serve it 1 to 2 days later. That caramel infuses the custard with the most wonderful flavor, so the longer you let it sit, the tastier it gets. You don’t want to wait more than 4 days, though. A thick skin can begin to form on the top, even if you’ve covered it with cellophane at that point. How do you flip a flan (without making a mess)? It’s quite simple. Use a pairing knife to slice just around the top of the flan where it may have baked to the glass ramekins. Then, insert the knife down the side and separate a bit of custard from the glass. You don’t need to cut all the way around. It should come loose with just a little bit of separating on the side. You can then take a plate and place it on top of the flan and flip, or you can just quickly flip your ramekin onto a plate and the flan should gently fall down. Lay a tea towel into a deep baking sheet and place your ramekins on top. You’ll be creating a “bain-marie” by adding water to the baking pan a bit later, and the towel is what prevents the ramekins from sliding around. (Don’t worry – the towel won’t burn in the oven when it’s wet). Set aside. 1. Make your caramel. In your small sauce pan over medium heat, add 1 cup of white sugar and 3½ tbsp. water. Give it a little mix with a spoon (only once) to make sure the water is evenly distributed. The caramel process should take about 12 minutes from when you turn on the heat to when you pour your caramel. 2. You’re going to simply watch your sugar boil for the next 5-7 minutes. Don’t stir it while it’s bubbling, just let it do it’s thing. You’ll notice little crystals forming on the top. No need to brush them away or mix. The bubbles are doing what they need to do. 3. After 5-7 minutes you’ll start to notice the color changing and a smell of caramel. Let it continue to bubble away without mixing for at least 1-3 more minutes. 4. When your sugar is starting to look like the color of warm caramel, pick your pan up and give it a good swirl. It will keep cooking once you remove the pan and swirl, so watch the color carefully. If it’s not quite there yet, place the pan back on the heat. It should only need about 1-2 minutes more. Note: If you don’t have a white pan, use a spoon to drip a few drops onto a white plate and check that the color is a warm caramel color. 5. Give your sugar one more swirl to make sure that it’s evenly cooked, and if the color is similar to the color in the photo, you’re all set. 6. Pour your caramel evenly into your ramekins. 7. Create a “bain-marie.” Fill your baking sheet with water up to about the middle of your ramekins. This will ensure heat is distributed evenly in the custard while it cooks. While your caramel sets, make your custard. Tip! You can also wait to fill your pan with water until it’s safely in the oven with a tea kettle. 8. In a medium pot, add 1½ cups of whole milk and 1 tbsp. of vanilla extract. Turn your heat to medium and heat while you prepare your other ingredients. 9. In your medium mixing bowl, mix 3 large eggs. 10. Once eggs are mixed, add 6 tbsp. of brown sugar, 1 tsp. pumpkin spice, ½ cup of pumpkin puree and 1 tbsp. whisky (optional). Whisk thoroughly. 12. Once your mixture is thoroughly blended, slowly pour it into your heating vanilla milk, stirring the whole time you pour. If you don’t stir, the eggs in the mixture may start to cook unevenly in the hot milk and get chunky. Once completely added, allow the whole custard mixture to heat for another 30 seconds while stirring. Remove from heat. 13. Evenly pour your pumpkin custard into your ramekins over the caramel. 14. Carefully carry your filled bain-marie pan to the oven (or fill the pan with a tea kettle once it’s placed in the oven) and place it on the bottom rack. Bake for 45 minutes to an hour until the edges of your flan are slightly brown. 15. Very carefully remove your pan and let the glasses cool down for about 10 minutes. When they’re cool enough to touch, cover them with cellophane and place them in the fridge to set for a minimum of 5 hours. Ideally, 1-2 days. 1. Add a ½ cup of heavy whipping cream and a tsp. of sugar to a clean sauce pan. Empty 2 chai tea bags into the cream. Simmer (don’t boil) for 5 minutes. Remove from heat, stir and let it steep for an extra minute. 3. Pour your cream into a food processor or blender and blend until whipped. When you’re ready to serve, simply use a pairing knife to cut around the top edges of the flan, and insert the knife down the side. You should be able to simply flip the ramekin onto a plate and it will fall down on it’s own, with all the luscious caramel dripping down the sides. Top with chai whipped cream. 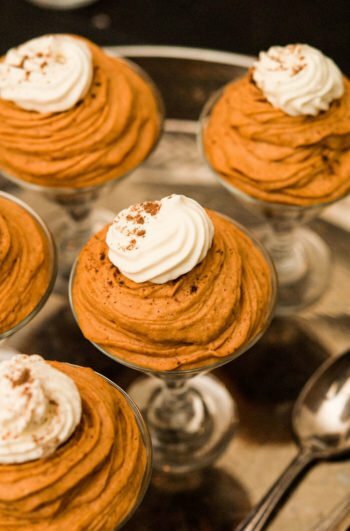 This pumpkin flan with chai whipped cream recipe is the silkiest, creamiest, most elegantly spiced flan you could serve at your fanciest Autumn dinner parties or decadent Thanksgiving dinners! Lay a tea towel into a deep baking sheet and place your ramekins on top. You’ll be creating a “bain-marie” by adding water to the baking pan a bit later, and the towel is what prevents the ramekins from sliding around. Set aside. In a small sauce pan add 1 cup of white sugar and 3½ tbsp. water. Give it a little mix with a spoon to make sure the water is evenly distributed, then allow it sit on medium heat for about 5 minutes without stirring or touching. This caramel process should take about 12 minutes total. After about 5-7 minutes, the color of your caramel will appear to have a light blonde color. If you don't have a white sauce pan, use a spoon to drop a small amount on a white plate to test the color. If it's too light (see above steps for reference), allow it to cook for another 2-3 minutes until the color turns a light-warm mahogany. When the color is just about right, lift the pan and swirl quickly for about 10-15 seconds. It will continue to cook in the pan while you swirl. Once swirled, pour caramel into the ramekins. Create a "bain-marie" by pouring water into your pan around the ramekins so the water fills about half-way up the glasses. This will ensure heat is evenly distributed while your flan cooks. Set aside. Pour whole milk and vanilla extract into a medium pot and heat on a medium flame while you mix the other ingredients in a mixing bowl. You don't want the milk to reach a rolling boil. Just a simmer. In a medium mixing bowl, mix 3 large eggs, then add 6 tbsp. of brown sugar, 1 tsp. pumpkin spice, ½ cup of pumpkin puree and 1 tbsp. whisky (optional). Whisk thoroughly. Use a standing blender or immersion blender to blend the dickens out of the pumpkin mixture. Blend for a full 1 to 2 minutes. This will ensure the flan is smooth as silk. Once the mixture is thoroughly blended, slowly pour it into the heating vanilla milk, stirring while you pour. If you don’t stir, the eggs in the mixture may start to cook unevenly in the hot milk and get chunky. Once completely added, allow the whole custard mixture to heat for another 30 seconds while stirring. Remove from heat. Evenly pour your liquid custard into your ramekins over the caramel and carefully place your filled bain-marie pan into the oven. Place it on the bottom rack. Bake for 45 minutes to an hour until the edges of your flan are slightly brown. Very carefully remove your pan and let the glasses cool for about 10 minutes. When they’re cool enough to touch, cover them with cellophane and place them in the fridge to set for a minimum of 5 hours. In a sauce pan, empty 2 chai tea bags (or add 2 teaspoons of loose chai tea), into ½ cup of heavy whipping cream. Add 1 tsp. granulated sugar. Heat on medium for 5 minutes while stirring. Remove from heat and allow to steep for 1 minute. Strain the tea from the cream and cool for 30 minutes in the fridge. To create whipped cream, add to a blender or food processor and blend until cream forms, about 30 seconds to a minute. 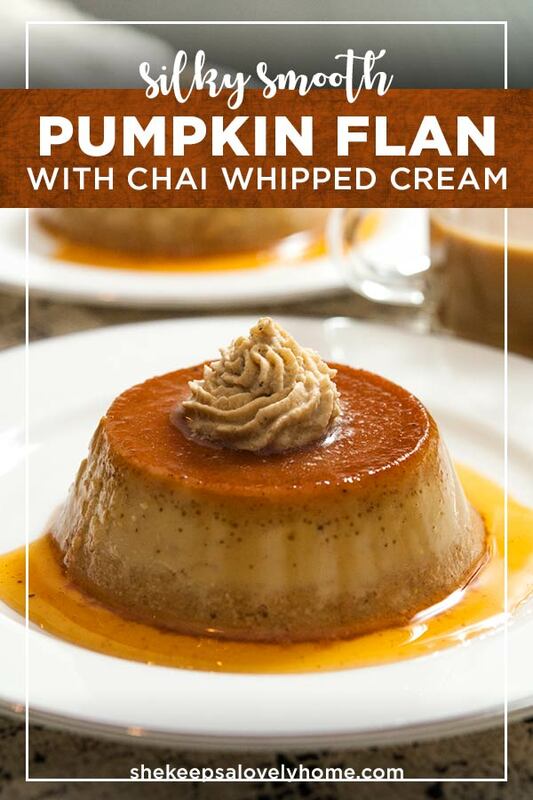 Pipe onto your pumpkin flan. When you’re ready to serve, simply use a pairing knife to cut around the top edges of the flan, and insert the knife down the side. You should be able to simply flip the ramekin onto a plate and it will fall down on it’s own, with all the luscious caramel dripping down the sides.